West Bloomfield High School Junior Dalia Rubenstein snaps a selfie with her date, senior Spencer Cohn. 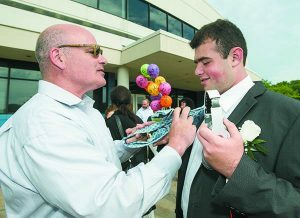 Spencer Cohn of West Bloomfield had his heart set on going to his prom to seal his lasting memories of high school with a fun night out on the town. He knew just whom he wanted to ask, and with the help of a teacher and supportive friends, he had a night to remember at West Bloomfield High School’s Senior Prom, held at the Detroit Yacht Club on Belle Isle in Detroit. Going to prom was also a dream come true for Spencer’s mom, Melanie Cohn. Like all parents raising kids with special needs, the thing she wanted most for her son was acceptance by his peers. 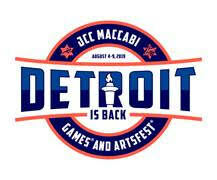 Six couples show their prom spirit before heading off to the Detroit Yacht Club on Belle Isle for the big dance. This acceptance in part came from a course offered in several area high schools called LINK. Also known as Peer-to-Peer Support, LINK is a course where general education students assist students with learning disabilities in classroom and social settings. The course’s goals include improving social, independence and/or academic skills for students with disabilities as well as helping students in the general population develop an understanding of individuals with disabilities. Students who enroll in the course may eventually pursue careers in social work, teaching or psychology. 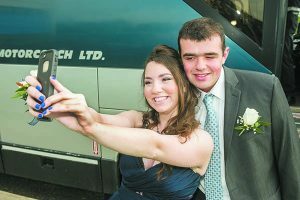 For about three years now, through LINK, WBHS seniors with special needs have been transported to prom in their own limousine bus, thanks to a generous anonymous donor in the Jewish community. 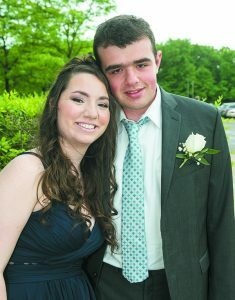 Spencer’s prom date was Dalia Rubenstein, 16, a WBHS junior who took the LINK course this spring semester. Volunteering with those with special developmental needs comes naturally for her. 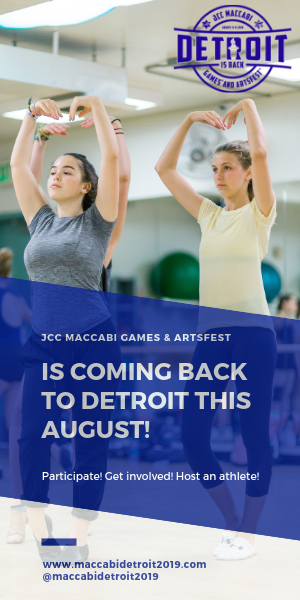 Ever since she could remember, she has accompanied her mother, Shoshana Rubenstein, ACSW, to help out at JARC events for adults. Through LINK, Dalia gained experience with learning how to more patiently interact with teens on the Autism spectrum and not to “rush to judgment” when conversations do not go exactly as planned. For example, sarcasm does not go over very well to those with very literal minds. Harry Cohn adjusts his son’s tie before he heads off to the WBHS prom. Though their families had been friends for many years, Dalia became better acquainted with Spencer through LINK. After Spencer asked Dalia, she asked a few of her friends — some were part of LINK, others were not — if they would like to go to prom with other kids with special needs. Altogether, six couples dressed up, met in the school parking lot to have their parents kvell over them and take their photographs before they boarded the limo bus to prom. Even though he prefers wearing shorts and a T-shirt most of the time, Spencer sported a tuxedo for the occasion. He said Dalia looked “great” in her navy blue prom dress. He gave her a white corsage. At his request, Dalia gave Spencer two picture frames: one to hold a picture of them at the prom and one saved for a graduation photo. Accompanying them on the limo bus was Janis Schiffer, a school social worker and a coordinator of the LINK program. Schiffer said that these couples going to prom together is proof positive of how LINK bridges the gap between students of all abilities. In the end, Schiffer knew her students with special needs were in good hands with their LINK buddies at the prom. She didn’t need to be with them at all times to be their “friend.” Instead, she was present at the prom just like any other adult chaperone, hanging in the background and watching the kids having fun.